Afghan President Hamid Karzai condemned the attack as "heinous"
KABUL, Afghanistan (CNN) -- As Afghanistan considers whether to engage in talks with the Taliban, the militant group carried out a brazen daylight attack in the Afghan capital on Thursday when three suicide bombers stormed a government ministry. Afghan policemen stand guard outside the Afghan Information and Culture Ministry in Kabul. Two of the bombers opened fire on guards outside the Ministry of Information and Culture, while the other bomber detonated inside the government building, Taliban spokesman Zabiullah Mujahid said. 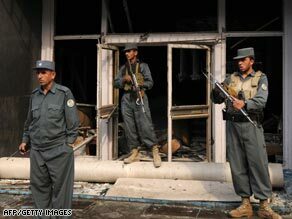 Kabul's deputy police chief, Alishah Ahmadzai, said five people were killed and 12 wounded -- six critically. But the Taliban claimed to have killed six guards in the attack, which it said targeted "foreign advisers" at the ministry. The Afghan government, in a statement condemning the attack, identified the five killed as "innocent civilians." Two bombers escaped, according to a Taliban statement. Kabul police have arrested one man suspected of helping the bomber, according to Ahmadzai. The attack comes two days after Afghan and Pakistani tribal leaders agreed to seek talks with Taliban leaders and other militant groups, so long as they promise to abide by the laws of each country. The United States has recently signaled that it would be willing to take part in talks with the Taliban if the Afghan government pursued that avenue. A ministry worker who witnessed Thursday's incident told CNN that he saw the three attackers dressed in traditional clothing enter the building shortly before 10 a.m. local time. "Two of the men opened fire on guards, while the third ran inside," said Bashir Azizi. "In a few seconds I heard a big bang and could not see anything else. "When I got up I saw wounded and dead bodies all around." Azizi was slightly hurt by pieces of a window shattered by the impact of the blast as he stood outside the ministry building. Afghan President Hamid Karzai condemned the attack as "heinous" and said it was an attempt by the "enemies of Afghanistan" to undermine "recent efforts by the government for a peaceful solution to end the violence." Afghan officials are planning another summit of tribal leaders, or jirga, with their Pakistani neighbors in two months to discuss possible peace talks with the Taliban. It is part of a broader strategy by Kabul to achieve peace with the militant group that is partly based in Pakistan but is waging a bloody insurgency in Afghanistan. Taliban leaders recently participated in Saudi-brokered talks with the Afghan government to end the country's bloody conflict, sources close to the historic discussions told CNN's Nic Robertson earlier this month. At this week's "mini jirga" in Islamabad, tribal leaders from Afghanistan and Pakistan concluded that the best way to expedite the process of peace and reconciliation -- and end violence -- would be by establishing contact with the "opposition." Afghan representative, former Foreign Minister Abdullah Abdullah, said the "opposition" includes any group involved in the region's surging violence. "The door is now wide open," he said. Earlier this month, U.S. Defense Secretary Robert Gates said the United States would be prepared to reconcile with the Taliban if the Afghan government pursued talks to end the seven-year conflict in that country. U.S. officials echoed those comments this week, including White House spokeswoman Dana Perino who said Tuesday that talks with Taliban elements are currently being considered in Washington. Speaking at a NATO conference earlier this month, Gates said any talks with the Taliban would mirror the U.S. strategy in Iraq. "We promoted a reconciliation that involved people we were pretty confident had been shooting at us and killing our soldiers," he said, referencing the Sunni Awakening Movement in Iraq. "At the end of the day, that's how most wars end," Gates said. The talks would not include al Qaeda, Gates said. The reconciliation would have to be on the Afghan government's terms, and the Taliban would have to subject itself to the sovereignty of the government, he added. "That's ultimately the exit strategy for all of us." -- CNN's Farhad Peikar contributed to this report.